“I’ve been thinking about how music leaders and teachers learn, and how our practice evolves. Among the most ubiquitous and troubling findings in our Inspiring Music for All report were those to do with practitioners’ lack of confidence in their ability to teach music, and the sense of isolation shared by many people across stages and contexts. These finding are echoed by successive Ofsted reports. So what can we do about that? How can we build an inclusive learning community for teachers, musicians and other music leaders that will address those needs effectively? We are a famously complex and varied community of practice, with different backgrounds, working environments, expectations, aspirations and affiliations; we may be members of several different professional associations; we may have qualifications or no qualifications; we may work in teams or by ourselves. We may not have access to consistent CPD support, or advice and guidance to help us create and follow through our personal professional learning plans; often we don’t have the money or time to participate in training opportunities. We go to seminars, network events, gatherings and conferences eager to make connections and refresh ourselves, and yet so often the impact is transient and short-lived, despite the quality or relevance of speakers and activities. How many times have you left a conference feeling determined to try out new things, contact new people or think about your work in a new way, and then six months later find your notes under a pile of papers and realise that the energy had just slipped away? Lest you think that I’m launching on an uncharacteristically negative rant, stand easy – I’m not! I’m very interested in working out what we can do with what we’ve got – the questions, ideas, skills, wisdom and experience held in our wildly diverse community are the most precious learning resource. Let’s unlock that – through online, live and blended learning models; through reading, writing and talking; through debate and discussion; through exchange, shared reflection and observation. Let’s buddy up. Let’s find learning partners we can share our questions and goals with, who’ll then ask us what we did about what we learned at that conference, or from that network, or in that online chat. It seems to me that unless we can raise our collective professional learning game, we’ll find it hard to push through to greater equality of opportunity and better, more consistent experiences for all children and young people. So I’m game – who’d like to be my learning buddy following the Music Learning Revolution? Katherine Zeserson is a Non-Executive Director of Musical Futures, and a keynote speaker at the Music Learning Revolution. 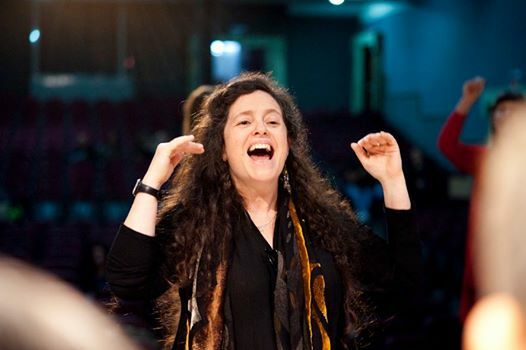 She has a long history of human empowerment through creative practice, through her work as Director of Learning and Participation at Sage Gateshead, Chair of Sing Up, and through her international reputation as a trainer, music animateur and educator.